In many ways, Prince of Persia should’ve been the perfect game for me. I like 3D platforming games like Tomb Raider but I don’t like the fact that I’m a little bit rubbish at them, die a lot and have to reload all the time. Prince of Persia does away with constant deaths and tedious reloading. The prince’s trusty companion, Elika, tirelessly swoops you up to safety every time you drop off a ledge or become endangered by an enemy. As I’ve mentioned in previous blog posts, I don’t have a long console history. All my early gaming experiences were on home computers. My first actual console (if you’re not counting the old “pong” machines) was the PS2. I thought, therefore, that it might be interesting to pick up the Sega Megadrive Ultimate Collection to see what everyone else was playing in the early nineties. I used to regularly blog about the games I’d been playing and also on my Gamerscore progress. However, as my last update was on July 13th last year it’s obvious I’ve not exactly been keeping up with things. I’ve even failed to record significant personal gaming events… such as passing the 40,000 Gamerscore mark and the purchase of a PS3! I’ve been a bit lax in recording my Gamerscore progress on the blog. Not that it matters because, after all, it’s done completely for my own benefit. I don’t expect anyone else to be interested in where my latest achievements have come from! Part of the reason I’ve not posted about things is that I’ve actually covered most of the games I’ve been playing in the reviews I’ve been writing for the Cranky Gamers UK blog. I suppose I could come up with a few words about some of the other games I’ve been playing recently. Unreal Tournament 3 has been in my disc tray a lot. It instantly brought back memories of all the time I used to spend playing the different versions of Unreal Tournament on the PC. The console version, Unreal Championship, was also one of the few games I used to regularly play on the original Xbox’s Live service. I’ve just finished the campaign which is merely a collection of bot matches arranged into “chapters” with a few cut-scenes in between. The storyline is a complete load of twaddle, taking a more Gears of War route rather than the tournament theme of the previous games. I’m going to be doing a full review on the game soon. There’s basically nothing wrong with it. It’s simply Unreal Tournament on the Xbox 360. The only thing is, if you’re a real Unreal Tournament fan then surely you’ll either be playing it on the PC or the PS3… both of which fully support the user created mods that have made the series such a success. Price Caspian is another title that’s in my current stack of games. I’ve only had an evening’s play of this so far. The developers seem to have wanted to mix the button mashing action of the Lord of the Rings film games with the character swapping of Lego Star Wars. I’m not sure how successful they’ve been. I’ll be going back to this one once I finish reviewing Unreal Tournament. The last achievement producing game, that I’ve not already reviewed, is Beijing 2008. I actually think that the control schemes for most of the games are extremely well thought out. I love the diving and the shooting. Many of the gymnastic events are a lot like rhythm games. The field events, although they need a lot of practise, actually work really well. The only event I truly didn’t like was the judo. The ultimate problem with the game is the reliance on button bashing for about half the levels, mostly the swimming and running. It really stopped me enjoying the game. It’s not Sega’s fault particularly. I just don’t find the Xbox 360 controller, with its shiny rounded buttons and the concave dimpled analogue sticks, comfortable to use in the way required to be competitive. It just isn’t designed for the amount of button mashing (or joystick waggling) that’s required. If you’ve got an arcade stick of some kind then I reckon you’ll enjoy the game a lot more. Maybe this is one of those rare titles that I should’ve picked up for the Wii? Had the achievements been a little more… er… achievable (sometimes breaking the Olympic record isn’t enough to unlock one!) then I might have been encouraged to spend more time on the game. As it it’s been traded in towards my PS3 fund. Beijing 2008 is extremely good value if you like these sort of games. It’ll be interesting to see what the rival game, Summer Olympics, will be like. The achievements look more obtainable at least. As it’s comes from the same games as last time I won’t spend a lot of time discussing my most recent thousand Gamerscore. I finished Lego Indiana Jones completely this week, picking up 1000/1000 achievement points. They’re definitely a lot more obtainable than those in the previous Lego titles. Picking up the DLC for Dancing Stage Universe gave me enough tracks to unlock another achievement for songs cleared. I don’t think I’ve ever come across such an eclectic choice of music in a game. It will be interesting to see what tracks Konami includes in their Rock Revolution game. I’m just about done with Spider-man 3. I was hoping to pick up the achievement for all missions complete but the final two seem to be Mary Jane “thrill rides”. If you thought MJ was annoying in the awful third movie, her character is even more infuriating in the game particularly as she constantly bosses you around during these “taxi” missions. I think I’ll give them a miss. A sudden rush of achievements, over one thousand during the last seven days, means that I’m completely behind on my regular Gamerscore updates. This blog is meant to be a personal record of my gaming so I’d better quickly jot down a few thoughts about what I’ve been playing. I was really, really disappointed with the latest downloadable content for the RPG epic Lost Odyssey. I’ve posted here before about how much I love the game and I was eagerly awaiting the translation and release of the additional dungeon. It was such a disappointment. For starters the dungeon itself is the exact same floor plan repeated over and over and over. You’re basically given an initial 50 Gamerscore for running down twenty-five flights of stairs. Then you hit the boss. It’s harder than any enemy already in the game, including the Immortal, and when you get defeated (believe me you will) you’ll have to start the dungeon all over again. There are no save points on the way down. It’s a real shame because there are some brilliant new monsters to fight on the way down and loads of great accessories to collect. However, unless you’ve got an über high-level team that’ll get you past the final challenge, you won’t be able to escape the dungeon to use any of it. I don’t think I’ll be putting the Lost Odyssey disk in again. A fair proportion of the latest Gamerscore came from Spider-man 3. My impression, from the reviews I read when this game was released, was that it got completely trashed by the critics. A quick visit to Metacritic reveals that that may have been a little unfair. It certainly received a huge range of scores, though, from the lofty heights of 95% to the barrel scraping lows of the 30% it was awarded from Edge magazine. I’m a fan of superhero games so I thought I’d try picking it up as a swap. I went into it not expecting much at all so it ultimately proved to be quite an enjoyable experience. I can really understand the critical panning of the game, though. The developers didn’t exactly move thing on much from the previous outings. In some ways the leap to the new generation of consoles actually coincided with the introduction of many negative features. There are far too many unforgiving “quick time” events for my liking. I really, really despise them. To supplement my Wii Fit “exercise” I picked up a copy of Dancing Stage (Dance Dance Revolution) Universe. I’m not going to get many achievements from this, due to the widely-acknowledged broken “quest mode”. However, I’ve made a good start on picking up the points for clearing the batches of songs. I wonder if we’ll see the release of the sequel over here? Hopefully it won’t suffer quite as long a delay as this version of the franchise. The game that pushed me well over the next thousand mark was Lego Indiana Jones. I initially wasn’t convinced that the “Lego Star Wars” mechanics were a good fit for the Indy franchise but Traveller’s Tales have included enough twists and tweaks to make it work well. I’m certainly enjoying it. It arrived on Thursday and by the end of the weekend I was already about 500 points into it. I’ll try to post more detailed thoughts about the game soon. There’s no getting away from it. The majority of my last thousand Gamerscore points came from the kiddie game Cars. I didn’t play it because I was after easy achievement points. I played it because I was under the impression that the game was fairly decent, it has a Metacritic rating of 70 afterall. It’s not really worth bothering with, though. Cars is a strange title that attempts to mix free roaming “open world” gameplay with more traditional racing events. Now I can see how younger gamers might enjoy exploring the setting of the movie but, unless you’re really trying to collect every last item in the game, there doesn’t seem much point in straying far from the main roads. All the “open world” did for me was make the task of trying to navigate to the next event marker even longer and more frustrating. There’s also some bizarre difficulty spikes, that surely would stop most younger gamers in their tracks, and some overlong circuit racing sections so it’s not a title that I’d recommend. It’s a shame really because the recreation of the characters from the film is well done and there are some mildly humorous cut scenes. I’ve probably been spoiled by Burnout Paradise. The remaining Gamerscore came from Rock Band (where I’ve finished the guitar solo tour on medium, vocal tour on easy and the drums also on easy), Virtua Tennis 3 and Penny Arcade Adventures Episode 1. I’ll probably try and get a review post up on the Penny Arcade game later. Harmonix’s Rock Band finally launched in the UK (and Europe) last Friday, on Xbox 360 at least. As I’ve been spending most of my game time playing this one I suppose I’d better post a few early impressions here. Now I’m not going to go on and on about the price. I will say that I was always intending to buy the pack with all the instruments in, until they released how much it was going to cost. In the end I ordered a copy of the game and a set of drums. I’ve been using my Guitar Hero guitars and a Logitech USB microphone rather than the official peripherals. I was initially a bit disappointed by the solo guitar tour mode. I think that, as I’ve played all the previous guitar games on PS2 and 360, it all felt very familiar to me. A little too familiar as many of the early songs featured in versions of Guitar Hero. Once you get into the game you realise that the tracks are done so much better in Rock Band than Guitar Hero. Harmonix just know how to take a song and convert it to their rhythm system so you feel like you’re actually playing it. The Neversoft guys who worked on Guitar Hero III just didn’t seem to nail that at all on the difficulty levels that I played. There are also lots of nice touches in Rock Band like the crowd singing along and I love the fact that you can continue to build up your “star power” when you’re in overdrive mode. One of the other things that initially put me off was that I started playing through on easy mode. Easy mode in Rock Band is really, really easy. If you’ve ever played a Guitar Hero game then you need to start on the medium level. A nice feature is that the achievement for completing the easy tour unlocks automatically when you complete a harder tour level so there’s no need to force yourself to play in newbie mode. I’ve just started playing through on hard and, although I don’t think I’ll manage to complete the setlist, I’m already further through it than I would’ve been in any of the Guitar Hero games. Perhaps it’s all a little too easy for Guitar Hero veterans but I’m sure the expert mode must be still challenging enough for master wielders of the plastic axe. For me, the choice of songs in this game is absolutely great. There aren’t many songs that I don’t know and the ones I don’t know, I liked on first play through. The vocal mode is so enjoyable. I’ve never played any of the Singstar games but I imagine that this is a very similar experience. I did have microphone issues at first. On my initial attempts at singing along I kept failing the songs. I was very confused. I’m not the world’s best singer, but I’m not so bad that I would be crashing out in easy mode. Eventually I tracked the problem down to the fact that I had the microphone muted in my Xbox Live profile settings. That’s what I get for being antisocial online, I suppose! After a few goes with the headset I decided to switch over to a proper USB microphone. It does provide a better experience. It’s a better tool to play the “tambourine” sequences with and is also a lot easier to trigger overdrive mode. As my drums were meant to be a birthday present I didn’t actually open them and use them until several days after getting the game. I’m glad I waited as it kept the excitement level up and meant that I didn’t try to cram in too much of the experience at once. The drum kit is very solid and not as noisy as I expected. I think I’ll invest in some sound dampening just to take the edge off, though. Playing the drums is really easy to get into on the first level of difficulty. I’ve yet to try them on the harder modes. They’re certainly an awful lot of fun to play. I’ve experienced very little of the world tour so I’ll reserve my judgement on that mode until later. The Rock Band solo experience is easily as good as Guitar Hero’s. In local multiplayer Rock Band really comes into its own. I’ve been playing the game a lot with my wife who, although she appreciates the songs and the enjoyment you get from playing along, isn’t really into spending a lot of time hammering the plastic strum bar. She has enjoyed the drums, though and actually likes the singing mode a lot more than she thought she would. It may be that we attempt the world tour with her on vocals. My sister also came to visit for a couple of days over the bank holiday. She’s a big Guitar Hero fan and loves the new additions in Rock Band. Banging out tunes as a three-piece was great fun. I think that if you’re really into Guitar Hero then it is well worth picking up a copy of Rock Band game just to use with your existing peripherals. It’s hard to justify the pricing on the official kit but if you are a rhythm game addict then the drums are almost impossible to resist. I’m just a bit worried about the long term value with new games, using different drum controllers, on the horizon. 1. 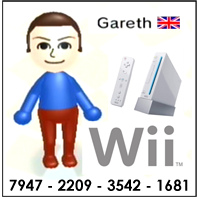 I’ve now been using the Wii Fit for 28 days. 2. It does seem to be doing some good. 3. The Wii Fit age is absolute twaddle as you can see by how much it bounces around. 4. I’m mostly doing aerobic exercises. The Yoga section is hardly used. Balance games, although popular at first, don’t get played that much.